My set-up. First post. For commnts. Never had any personal experience with marijuana in the past. But now have the time and facilities to grow a few plants. The last few months has been in collection information and growing a few plants as an experiment. My plants are now one month old. For now they are indoors since we are in the throes of Winter. I am a grower of vegetables so plants are not new to me. The plants will be ground grown outdoors when suitable weather arrives. I have three plants growing. My setup is a 23 liter pail as a controlled environment. Lights are full spectrum Compact Fluorescent Bulbs with a reflector, plus a window sill, which is used when the Sun is shining. The bucket has a fan to stir the air slightly to strengthen the plant stems. Heat is not an issue, since there is enough air flow, which can be improved by drilling holes in the pail if necessary. The soil temperature is about 28C. 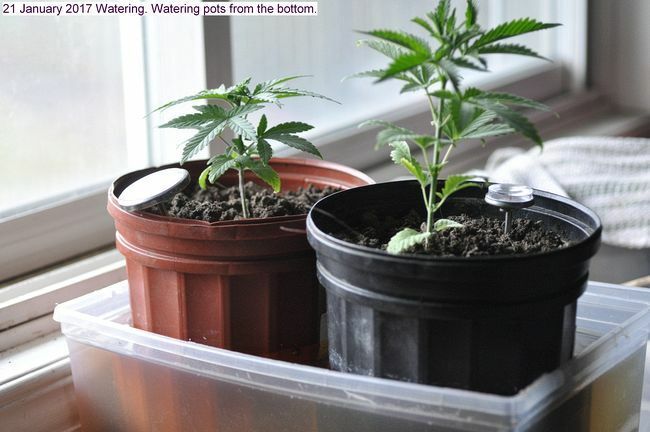 Watering is from the bottom by placing the pots in a water filled container as required. At present the lights are on 24 hours. The soil is my own, made in the Summer, which is used for all my seedlings. This is my effort to date. Home cultivation of marijuana plant growing. Procedure was trial and error and extracting information from the internet. Three seeds were germinated by placing on a damp paper towel and placing in a warm temperature of about 25C. The seeds sprouted in three days. The seeds were then planted in a plastic cup in homemade plant soil, which is used for all of my seedlings. In three to five days the seeds grew a long skinny plant. 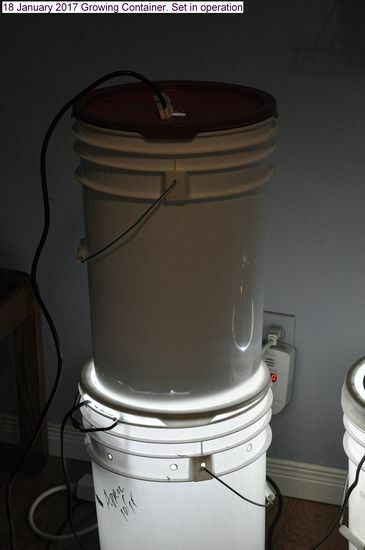 To improve the plant artificial light a compact fluorescent lamp 60 watts full spectrum with a reflector was added in a five gallon bucket, with a fan to gently stir the plant. Light was applied 24 hours a day. The soil temperate was about 28C.The lamp generates little heat. When the plant began to perk up, it was placed in a larger pot. It appears to be thriving. The height of the lamp from the plant can be adjusted easily by tying back the electrical cord. It appears by some innovation that the plant can be matured by adding another 5 gallon pail on top of the existing set up. It is important to gently agitate growing seedling to strengthen the main stalk. But the most important variable is light. Sunlight is best but usually not sufficient in a Northern winter climate. Last edited by Durgan; 01-16-2017, 09:01 PM. Reason: The year is 2017 apparently I am still in 2016 Sorry. Sounds like a plan, Durgan. Don't forget that giving plants a head start on an outdoor grow can result in BIG plants. Sounds like you have it covered Durgan. Nice one. If you're a keen gardener then you should have no trouble here. That's quite a long veg period before spring. You might want to train her to make a nice bushy plant. You will need to be totally sure that the frost has passed before putting her out, and spend some time hardening off before committing her to the outdoors. I say 'her'..... what is the provenance of the seeds? Are they feminized? It's a long time to wait to get males. Afghani – Regular Seeds Chosen at random. A container system was made for growing one marijuana plant to maturity. Two 23 liter plastic pails were modified to allow room for growing. The plastic was modified with a coping saw and a hot soldering iron. The lamp was made adjustable with a simple clamp on the cord. A convenient fan was installed for some air movement. Vent holes were burned around the periphery of the bottom pail for some fresh air. The lids of the pail were cut out to make a stable system. The plant pot can be easily removed for watering and maintenance. The system is self contained and can be moved easily. Made a second container set-up. Will experiment with that for now. Plants are watered from the bottom by placing in a trough to soak up water. This tends to inhibit damping off. Also a small fan air is directed to the plants to gently rustle the leaves. This strengthens the stems and discourages the growth of mold. The point of this progression is guide you through the way toward setting up your understudy online journals. Looking great Durgan. You're clearly all over this. The only thing I would add is that, from what I have heard, plants need a few hours to rest and assimilate the energy they have taken on in the day, so 4 - 6 hours darkness is not only good for them, it avoids wasted energy costs too. an 18/6 cycle seems to be the most common. I changed from 24/0 to 18/6 and didn't notice any difference in rate of growth.